Apparently, all it takes to start a watch company these days is to be a couple of thirty-something guys from Switzerland. Or Australia. Or anywhere in between. And that is fantastic. 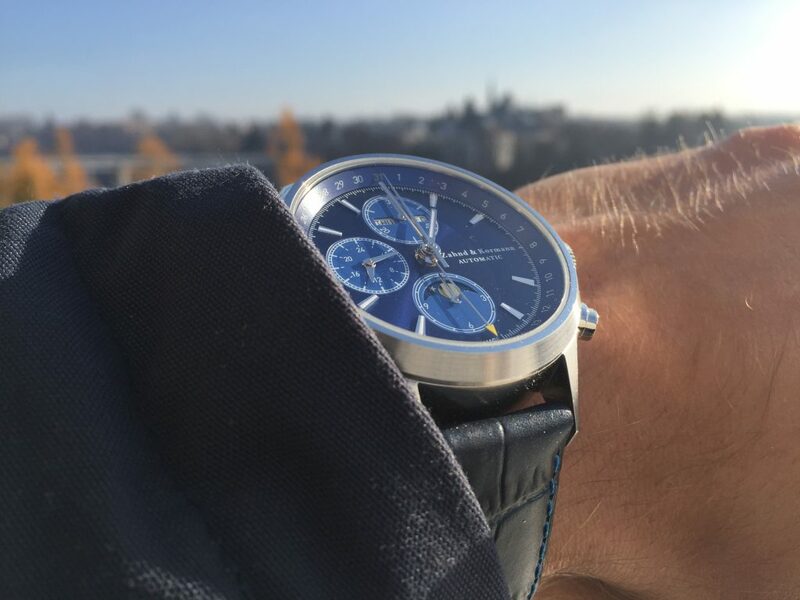 Zahnd & Kormann is just a couple of friends from Switzerland and their freshman effort is proof that the democratization of watchmaking is indeed fantastic. Their ZK No.1 is a fairly standard ETA Valjoux 7751 automatic chronograph at a fairly non-standard price. They haven’t taken any risks with the design or played with the movement (other than signing the rotor). But that restraint is all for the better. When their Kickstarter launches later this month, they are promising a sporty and discrete Swiss-made chronograph for around $1,200. That’s an early bird price for the first 100 watches, and it rises by a grand at retail. But even at $2,200, you will be hard pressed to find another Valjoux 7751; and there is hardly one to be found at any price that matches the sporty design of the ZK No.1. The Valjoux 7751 is a moon phase, full calendar, and 12-hour chronograph, with a 24-hour hand (not a second time-zone). That’s a lot of information to pack into the ZK’s 41 mm case, but its clean dial leaves things uncluttered. The dial is standard 7751 fare, with three subdials and a date register on the rehaut. Applied and lumed batons call out the hours that aren’t dominated by the subregisters and a simple text logo occupies the whitespace at 3:00. I’d like to see a more stylized and smaller logo there, but I can understand the temptation to put your name on what is clearly a labor of love. The hands follow the dial’s simple lead: slightly tapered sticks that look to be mostly lume, a needle chronograph second hand, and an arrow date indicator with bright yellow tip. The subdial hands look a bit flat, but it’s hard to judge from pictures alone. That date arrow is the boldest design statement the watch makes, but the subtlety does wonders for the design, working with the Arabic numerals to make it look sporty yet understated. The dial and the movement are both covered in sapphire. The watch comes in two flavors: Black Moon and Blue Moon. The Black is all black (dial, PVD case, and leather strap), while the Blue is mostly blue, except for its brushed stainless case. You get a pair of Swiss leather straps, with contrast stitching on one to punch up the sportiness and matching stitching on the other for dressier occasions. Both straps come with quick release spring bars, which I love; they make changing the strap easier than changing the time. The ZK should be on Kickstarter soon, or you can win one from the manufacturer. If you do intend to back the project, the huge early bird discount should motivate early action. I’ll wait to see the ZK in the metal before passing final judgment, but watches like this fill me with hope. People in the watch world talk about the decline of fine watchmaking, but I don’t see it. Sure, some luxury brands are experiencing drooping sales. But when a couple of guys (or gals) can put together a high-quality watch at a really good price, who could doubt that we are in a new golden age of watchmaking? timeisyours.ch.